S-XL Each for $15.15. Each case of 12 $157.08. 2X Each for $15.86. Each case of 12 $166.32. 3X Each for $16.63. Each case of 12 $175.56. 4X Each for $17.40. Each case of 12 $184.80. 5X Each for $18.17. Each case of 12 $194.04. 6X Each for $18.94. Each case of 12 $203.28. 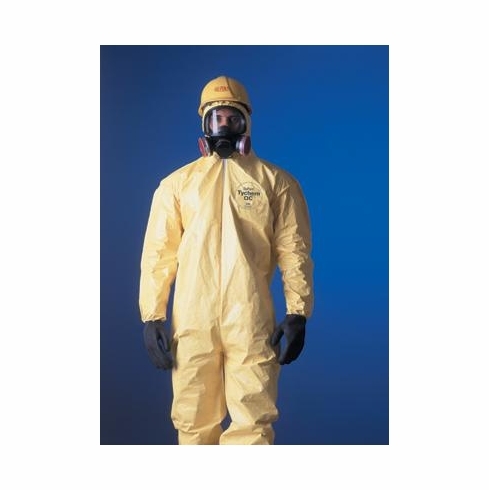 DuPont™Yellow Tychem® QC Chemical Protection Coveralls With Bound Seams, Front Zipper Closure, Attached Hood, Elastic Face, Elastic Wrists And Elastic Ankles. Tychem® should not be used around heat, flames, sparks or in potentially flammable or explosive environments. Garments made of Tychem® fabrics should have slip-resistant or anti-slip materials on the outer surface of boots, shoe covers, or other garment surfaces in conditions where slipping could occur. Used extensively in the petroleum, pulp and paper, food and chemical processing and pharmaceutical industries.